POLB PROPOSES PIER B ON-DOCK RAIL SUPPORT FACILITY: The operation would shift more cargo to on-dock rail, where containers are placed directly on trains at marine terminals. POLB will host public hearings January 11 and January 18 on on-dock rail study. On-dock rail would significantly reducing trucks trips throughout the region. The Port of Long Beach will begin public hearings next week on a draft environmental study for the proposed redevelopment of an existing rail yard into a new facility that could increase the use of on-dock trains, moving cargo faster while making operations more sustainable. The Port will host the first of two public hearings January 11 to gather comments on the study, released in December. The second hearing will on January 18, at the Port Interim Administrative Offices. 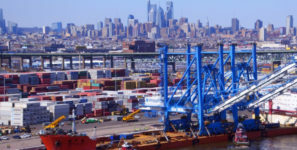 The Pier B On-Dock Rail Support Facility, proposed for the northern area of the port, would shift more cargo to on-dock rail, where containers are placed directly on trains at marine terminals, significantly reducing trips by trucks throughout the region. No trucks would visit the rail facility. Instead, smaller train segments would be brought to the facility to be joined together into a full-size train. The rail yard would be operated by Pacific Harbor Line, which provides short haul rail transportation switching services, railroad track maintenance and train dispatching services under contract to the port. Pacific Harbor Line is the first railroad in the nation that has converted its entire fleet to clean diesel locomotives that reduce air pollution and save fuel. A fact sheet and the draft Environmental Impact Report (EIR) is available here. The draft EIR analyzes the impacts of the proposed development, and the mitigation measures that would be used to address those impacts. The port will welcome comment on the study through February 13, 2017. Comments can be made in person at the January 11 and January 18 public hearings or sent in writing to Heather Tomley, Director of Environmental Planning.